• Students at The New School come from all 50 US states and 117 foreign countries. 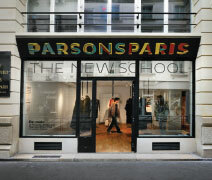 • Parsons is located in New York City and in Paris, France. Imagine a university where scholars, artists, and designers find the support they need to challenge convention and fearlessly create positive change in the world. 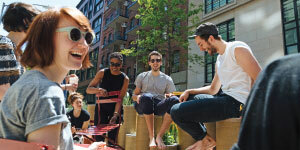 The New School is just such a university community, attracting students from all over the world to its home in the heart of Greenwich Village. Founded in 1919 by those who imagined a school that would rethink the purpose of higher education, The New School now offers more than 10,000 students areas of study across more than 135 undergraduate and graduate degree programs. No matter what area of study students pursue, they discover a unique form of creative problem solving that will forever change the way they investigate and create—relentlessly questioning convention, collaborating across disciplines, and taking risks. Parsons offers undergraduate degree programs in New York City and Paris—two of the world’s epicenters for innovation and creativity. Students are enabled to develop the knowledge and skills needed to succeed in a rapidly changing society through collaboration with peers, industry partners, and communities around the world. More than 1,150 full- and part-time faculty teach at Parsons, all of them successful professionals in their fields. And the students hail from more than 65 countries and every possible background, bringing a truly global perspective to classes. Students and faculty work side-by-side in studios and labs to fulfill creative visions and design master works of art in Parsons’ undergraduate programs in Architectural Design; Art, Media, and Technology (Parsons Paris only); Communication Design; Design and Technology; Fashion Design; Fine Arts; Illustration; Integrated Design; Interior Design; Photography; Product Design; and Strategic Design and Management. Attending Parsons will give you something in common with Donna Karan, Tom Ford, Jasper Johns, Marc Jacobs, Victoria Hagan, Norman Rockwell, and Edward Hopper: you will all be alumni of the same college. The New School’s New York City location offers access to hundreds of cultural opportunities as well as a wide array of internships and apprenticeships with top designers. Students can shape their education and take advantage of all the University, the city, and the alumni network have to offer. The cost of attending The New School varies by program. Most of our students take advantage of financial aid. US citizens and eligible non-citizens must complete the Free Application for Federal Student Aid (FAFSA), and undergraduate degree-seeking international students interested in grants or scholarships from The New School should complete the Undergraduate International Student Scholarship Application.